The process of solving problems and disputes through mediation has been carefully designed and proven over time to achieve the most satisfactory results with a minimum of upset and acrimony on all sides. Whatever the dispute involved, the following is a general outline as to how the process unfolds. The drop down menu of Services above covers specifics of each type of dispute mediation. The mediation process begins with a one-hour consultation between the mediator and the parties involved. This initial meeting is designed to be exclusively informational, during which the process is explained in detail and ample opportunity is provided for questions to be answered and concerns to be addressed. Historically, the meeting has enabled people to make an informed decision whether the process is consistent with their expectations; whether mediation is the right choice for them; whether they feel comfortable with the particular mediator. If both sides decided they want to participate in the mediation process, they can schedule necessary appointments for their mediation. Our mediators resolve many different kinds of disputes, and strive to be as flexible as possible in regard to scheduling. Discussions must be preceded by the provision of relevant information, without which meaningful dialogue cannot occur. Full and honest disclosure of assets and liabilities, income and expenses is required. This is critically necessary as the basis for an informed, binding and enforceable agreement. Accordingly, the first mediation session ordinarily encompasses the thorough explanation and enumeration of what information needs to be obtained and what documents need to be produced. Guidance is provided to enable the participants to address relevant issues and explore alternative choices, hopefully culminating in acceptable solutions that both endorse. This process occurs in a neutral setting, where all participants are expected to engage in a courteous, respectful and focused dialogue. The schedule of appointments varies depending on the needs of the participants and mediators. Sessions ordinarily occur on a weekly or bi-weekly basis, at days and times agreeable to all. Each session is ordinarily one hour or one and a half hours in length. As to any and all issues, nothing is decided, let alone included in a written agreement, unless and until each party clearly communicates his or her consent on each issue. Each party has the absolute right to terminate his/her participation in the mediation process at any time prior to signing of an actual written agreement. 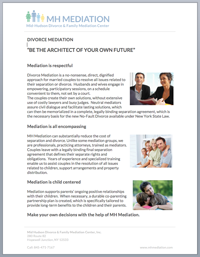 How Much Does it Cost to Get Divorced using Mediation? Is Your Marriage Over? What Happens Next?